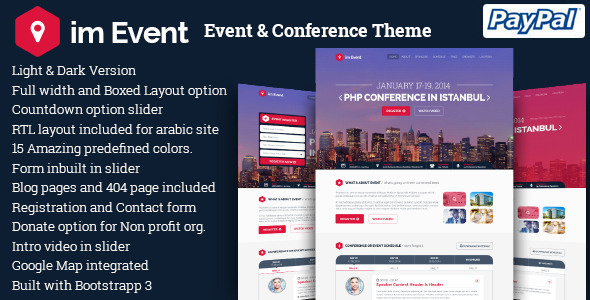 Imevent theme is in two different color scales- light and dark version. Therefore, you can choose the your favorite version. ImEvent template supports both Right To Left language layout and Left To Right language layout. This allow you to select any kind of language for your site. Register feature is dedicated for every event site. With ImEvent theme, it will be flexible when it allows users add extra fields for register form in admin. This is feature so that you can set easily the time and wait until come. with count down event, users will see the closest event ready to beginning.